They're here! Finally a whole team of Canadians have come to help us in our work here. This group has come from my home province of Nova Scotia and are spending a week in mission in MD before heading off to the Baptist World Youth Congress in Leipzig, Germany. It's wonderful to have them here. 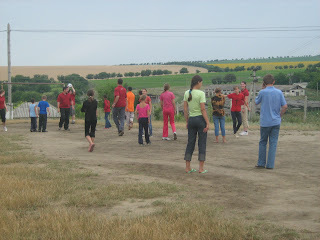 Yesterday we went to stay in a small village in the north of Moldova where our host pastor is serving the young church plant there. 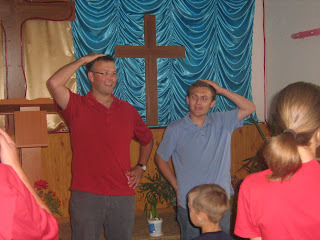 Here you can see Rob, leader of the team, teaching the children how to sing 'Head&Shoulders, Knees and Toes". 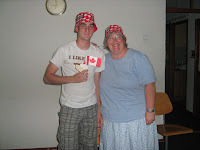 That's Viorel on the right, who is translating for our team. As well as learning some Moldova phrases, the team is working hard to learn some Moldovan songs which they can then teach to the children. They did very well today with "Isus iubeste pe fiecare". The women of the church are feeding our Canadian young people very well and nobody is complaining about the food - it's all so good! It's a good thing, as they need lots of energy to keep up with the kids they are working with. All afternoon Tuesday the group played football with the village children who had come to the program. The village they are in is very beautiful and all is green and luscious-looking. The church itself is absolutely lovely and as well as a place for the children's program, it also provides a place for the team to stay - and an indoor bathrooom and hot showers as well!! 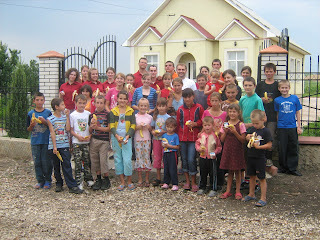 Here's our Canadian team along with the children who showed up on the first day. They're standing in front of the lovely church where they are staying. Please keep this group and the children whose lives they are touching, in your prayers. Posted by Barb at 12:55 a.m.